His Holiness the Dalai Lama formally announced the existence of His Eminence the Ninth Khalkha Jetsun Dhampa, Jampal Namdrol Chokye Gyalsten, in September, 1991. Khalkha Jetsun Dampa is considered to be one of the most revered teachers of the Kalachakra Tantra, the Tara Tantra, and Maitreya, the future Buddha. All of these lineage teachings descend directly to him from Taranatha, the great historian and Tantric practioner (B. 1575 AD). Khalkha Jetsun Dhampa has realised incarnations in all the lineages. Prior to his incarnation as Taranatha, he was known as Jamyang Choje, who helped to establish Drepung Monastery outside Lhasa. In the Nyingma he was known Rongzong Lotsawa Chokyi Gaytsen; in the Kagyu Baromba Dharma Wangchuk; in the Sakya lineage, he was known as Master Kunga Drolchok. It was after this incarnation that he was to be reborn as Taranatha. But at that time, the mother of Taranatha was still only a young girl of fourteen; so instead, he took rebirth as the son of an Indian king. He lived so, until he was fourteen years of age. At that time, as he stood one day on the roof of the king's palace, his dakini mother, whose name was Khadroma Yum Dorje Buka, appeared to him in the sky and bade him come to her. He then took rebirth, as Taranatha. Taranatha's work is of special interest with respect to the Tantric period of Buddhism in India. Later, while teaching in Tibet, he established Takten Phuntsok Ling Monastery, about three hours outside Shigatse, which had 500 monks and many branch monasteries throughout Tibet. At that time, Taranatha was said to have given the Kalachakra initiation two or three times each year at his monastery, later renamed Ganden Phuntsok Ling. In his later years, it is said that Taranatha, who was known for his great wit and humor, had joked during a teaching about where he might take rebirth. It was said that a Mongolian student who was present had spoken out and pleaded, "Oh, please come to Mongolia next time!" It was said that this remark set up the conditions for his next rebirth. Taranatha was his 14th notable reincarnation and directly preceded the First Khalkha Jetsun Dhampa. As the 15th reincarnation, the First Khalkha Jetsun Dhampa, became the head lineage lama of the many monasteries throughout Mongolia. The First Jetsun Dhampa, Tenpei Gyaltsen, Rangjung Yeshe Dorje, was born the son of a king in Mongolia. He was recognized at an early age to be an incarnate lama and, at the age of fourteen, (ca. 1650), he made a pilgrimage to Kumbum, the birthplace of Je Tsong Khapa. From there, he travelled to Central Tibet to visit the Fourth Panchen Lama, Panchen Losang Chogyen, and the Fifth Dalai Lama, Ngawang Losang Gyatso. It was at this time that the Fifth Dalai Lama recognized the young tulku to be the reincarnation of the saint Taranatha, who was greatly respected as a chief lineage of all traditions with reincarnations going back directly to Shakyamuni Buddha. Both the Fifth Dalai Lama and the Fourth Panchen Lama then became Jetsun Dhampa's teachers and gave to him all the initiations, oral transmissions and commentaries. The title, Khalkha (the largest district of Mongolia) Jetsun Dhampa (Lord of Refuge) was also conferred upon him at that time. 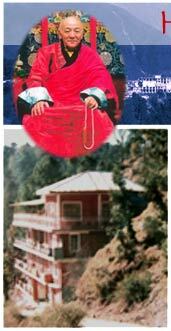 He then returned to Mongolia where he strongly established the Gelukpa school throughout Mongolia and Central Asia. Khalkha Jetsun Dhampa's close friendship with the Dalai Lama, this lifetime, dates back to earlier years in Tibet, before 1959, when they had shared tutors in their youth and remembered meetings, as well, for play and family gatherings at Norbu Lingka. Their present friendship continues the long tradition of close ties that they have held historically. It was the Fifth Dalai Lama, Losang Ngawang Gyatso, who recognized the First Khalkha Jetsun Dhampa as the reincarnation of Taranatha when the young tulku first travelled to Tibet from Mongolia, and who also became his lineage lama at that time, conferring on him all his lineage initiations, empowerments and the further teachings, as well as his present title. The Sixth Dalai Lama recognized Khalkha Jetsun Dhampa as the emanation of Chakrasamvara; as Vajrapani in the Tantric sense; and as Namkai Nyingpo in the Bodhisattva sense. Later, during the time of the Seventh Dalai Lama, the two took rebirth in the same family, making them blood relatives as well. The Thirteenth Dalai Lama and the Eighth Jetsun Dhampa extended their bond of understanding into the temporal realm, by each exchanging official documents of mutual recognition of the independence of both Tibet and Mongolia, in 1911; and later, in 1913, by having their representatives sign a treaty at Urga (now Ulan Bator) "declaring their independence from China and agreeing to strengthen Tibeto-Mongolian ties." Both the First and the Eighth Jetsun Dhampa were said to have led very exemplary lives, especially as dharma leaders in Mongolia and the neighboring regions of Central Asia. The First had a very long life, which added to his enduring influence as the head lama of the many monasteries throughout the region. The Eighth's more worldly and political influence was far-reaching and proved particularly effective at the turn of the twientieth century, and into the years of great turmoil and transition that marked outer Russia and inner China. While the First through the Fifth had been fully ordained monks, the Sixth through Eighth later married and took consorts. He guided his people through the traumatic time of communist upheavel in Russia which finally led to the absorption of Mongolia into the Soviet Union. The eventual shutdown and destruction of the monasteries that followed led to the virtual disappearance of Buddhism in Mongolia for over 60 years. Thus, when the present Ninth Khalkha Jetsun Dhampa's incarnation was recognized, at the age of four, by Reting Rinpoche, the Regent in Lhasa, as well as other high lamas and the state oracles, his identity was kept secret due to Stalin's influence and oppression in Mongolia. The country vanished from sight, customs and traditions were buried and lost until the five visits of the Dalai Lama in recent years; the last time was in August 1995 when he gave the Kalachakra Initiation. The Ninth Khalkha Jetsun Dhampa was born at Tromtsikang and then moved to Shol, just below the Potala. His father, Lobsang Jampal, was from Phenpo and his mother, Yangchen was from Kham. At the age of seven, he entered Gomang College, Drepung Monastery, as a simple monk where he studied philosophy for fourteen years, up to the level of Madhyamika. At Gomang he studied primarily with a teacher from Mongolia named Geshe Thupten Nyima. He received his dharma lineages from His Holiness the Dalai Lama. His Holiness the Panchen Rinpoche, Gyabje Trijang Rinpoche, Gyabje Ling Rinpoche, and Gyabje Lhatsun Rinpoche were his teachers in the Gelukpa lineage. H.H. Dilgo Khyentse Rinpoche was his teacher in the Nyingma lineage; Kalu Rinpoche was his teacher in the Kagyu lineage; and Sakya Tenzin Rinpoche was his teacher in the Sakya lineage. At the age of 21, he left Gomang College and Drepung to engage in a series of Chod meditations, living the life of a yogi, while on pilgrimage to the holy sites of Tibet. At the age of 25, he gave back his monastic vows, and then went to stay at Ganden Phunstok Ling, established by his predecesor Taranatha, until the age of 29 when the Chinese invasion forced him into exile, along with hundreds of thousands of Tibetans. In India, he lived with his family in Darjeeling and Mysore, until 1981, and later in Madhya Pradesh in central India until 1990, quietly serving as lama for the Tibetan community in exile throughout that time. During this period of time Rinpoche did many meditations and gave public teachings in the Tibetan settlements several times a year. Then, in 1991, with the dissolution of the Soviet Union and the new-found religious freedom felt in Mongolia, many Mongolian monasteries sent their abbots and lamas and ministers to India to request inquiry of the Dalai Lama in Dharamsala about the possible location of the Ninth Khalkha Jetsun Dampa. Did His Holiness know where he was, who he is, and could the Dalai Lama recognize him for the peoples of Mongolia? It was at that time, through the Religious Office of the Tibetan Government in Exile, that the Dalai Lama gave the official stamp of recognition and acknowledgement of the Ninth Khalkha Jetsun Dhampa, the spiritual head of Buddhism in Mongolia. He moved to Dharamsala to be closer to His Holiness the Dalai Lama, and in 1991, he was officially enthroned as the Ninth Khalkha Jetsun Dhampa, amid great and joyous celebration.